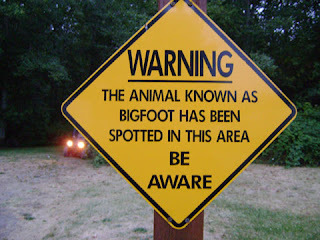 It seems our own appearance on BlogTalk Radio's SquatchDetective show this Wednesday has innaugurated a full-blown crazy week of Bigfoot in the media. (LISTEN TO THE SHOW WITH YOURS TRULY... HERE.) 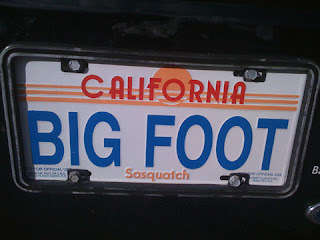 Right now our show is at #3 among the 500 rankings on BlogTalk under the search term, "Bigfoot." Cool! At least we didn't flub up too badly. We have word from the inside (we know a guy who knows a guy who knows a guy who is involved) that the folks from the MYTHBUSTERS TV show will be up here in Humboldt County this weekend filming an episode "debunking" Bigfoot. They are contracting with a member of Blue Lake's Dell'Arte International School of Physical Theatre (founded by Carlo Mazzone-Clementi) to wear the Bigfoot suit. The theatrical troupe and school focuses on physical theater and comedy, so we will probably get an agile and possibly convincing Bigfoot enactment from them, but it could also be a mocking and exaggerated one. Whatever the case, we are sure this show will be a smug and superficial dismissal. We are already arranging to play some pranks on them wearing a Sasquatch suit and tracking them around, throwing rocks from the trees. Coming up on Sunday night is the much anticipated National Geographic BIGFOOT documentary. We and Crazy Ian encountered the scientific and filming crew from this show down at the Patterson-Gimlin Film Site on Bluff Creek this summer. Read about black helicopters landing on the PGF zone and other musings in our PREVIOUS BLOG. We have high hopes for this film, as the producers told us they were giving the PGF and other evidence a very serious and fresh new consideration. They did high resolution scans of the entire film site area with a density penetrating device that will hopefully aid us in locating markers that will prove the exact location and trackway. One problem: did the find the REAL film site? We had our doubts. They also obtained an incredibly high quality scan of an apparently first-generation copy of the film from Patricia Patterson. We are intensely curious as to whether they plan to issue this entire film copy in digital form on the DVD. This one will depend in a vast way on the Bonus Features, folks! It could be great! Sasquatch. The Wild Man. Bigfoot. 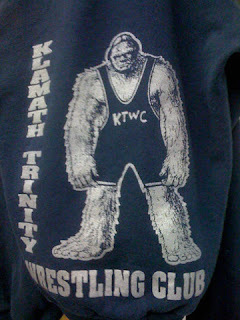 Believers in the massive creature claim he's half man, half primate and roams the Pacific Northwest. Join a team of experts as they use advanced scientific analysis to investigate the phenomenon to reveal what's science, and what's science fiction. Follow along as we break down one of the most controversial pieces of evidence... a 40-year-old film that many believe is actual video of the apelike being." Go to the National Geographic page for the show HERE to view some photos and a video clip featuring Jeff Meldrum. 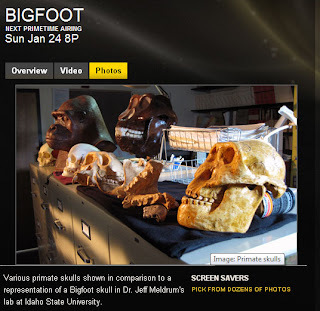 "Sunday, January 24, 2010: George Knapp welcomes researcher David Paulides and forensic artist Harvey Pratt for a discussion on the relationship between Native American cultures and Bigfoot. They'll also provide eyewitness accounts of the creature that bridge the gap between folklore and fact." "Due to technical difficulties, tonight's live program has been postponed. 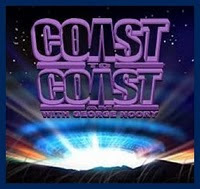 In its place, we are airing the 2/17/08 episode featuring George Knapp talking with Jim Marrs about UFOs, remote viewing, and the JFK assassination. Previously scheduled guests Kathy Strain, David Paulides, and Harvey Pratt will be rescheduled. " We've just received a call from Bunbury Films regarding their fine documentary, BIGFOOT'S REFLECTION. We blogged about and reviewed the film HERE. Their web site for the film is up and running live, and their representative Andrea tells us they are in process of posting all sorts of BONUS FEATURES for the film on the web site for free access rather than putting them on the DVD itself. This includes trailers and unreleased portions of the interviews with some of Bigfootings great figures. 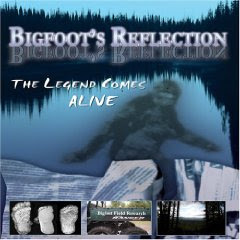 CHECK IT OUT or get the film at bigfootsreflection.com! During the development of this site one might want to check out their FaceBook fan page, where an interview segment with John Green and other goodies are posted. More NEWS: We've been contacted by a graduate student and his film documentarian partner, and they will be visiting us in early February. They are workikng on an MA-level thesis project in Anthropology, intending to produce a serious documentary film on the Bigfoot phenomenon. We're going to visit and interview Bigfoot godfather, Al Hodgson. Look for that! 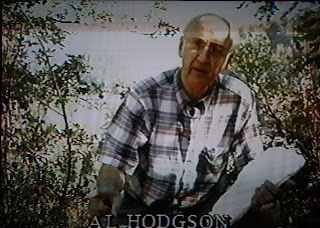 Image: Al Hodgson on an A and E documentary. In our conversation with Al we here at Bigfoot's bLog intend to clear up some issues regarding the PGF timeline, and debunk (we hope!) the notion that Roger and Bob were in Bluff Creek and Willow Creek at the same time as John Green and Rene Dahinden, in the fall of 1967. Watch out, "Massacre" believers. Will the GCBRO let us post THIS? We doubt it! Also! an update just came in regarding our previously blogged ODEN FLAT SIGHTING. 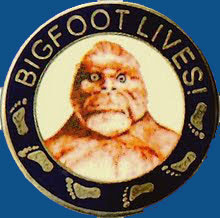 Big news there regarding some very convincing repeated and habitual Bigfoot activity. We will be going there with the aforementioned film guys to investigate with the residents, so look for an update soon! BFRO, do you want to get involved? We need to get some game cameras up. Everything is Bigfooty in our area!!! 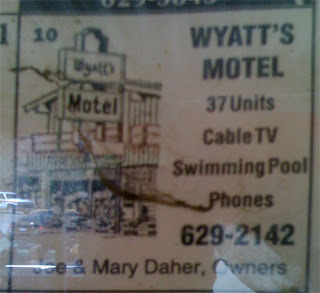 Wyatt's Motel ad--now known as the Bigfoot Motel, this was the site where the founding members of the Pacific Northwest Expedition including Green, Titmus and Dahinden first met with millionaire organizer, Tom Slick, and looked at a jar full of moose poop and other evidence. 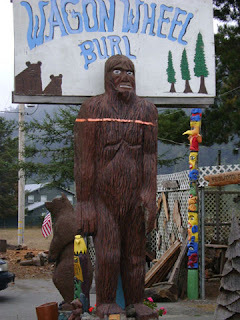 A sign warns campers in the Klamath KOA that there be Sasquatch in them thar woods! License plate seen at the Willow Creek Post office. The driver was an unknown primate. Photos by Steven Streufert save for those from company and corporate promotional logos/sites. How come no hu-man ever film or interview ME? Me no get it. What yer problem? Me no clean enough for you, stinky hu-man? Me no talk good? What? Jeez. Me go back to cave. 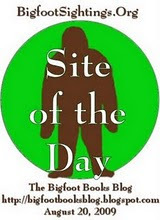 This blog copyright 2010 Bigfoot Books Intergalactic. Please provide citation and link if quoting. Thanks!